Airport transfers, to and from Geneva, are included in our fully catered packages (or can be added onto your self-catering option). Guests are transferred in luxury 8 or 9 seater mini buses from Geneva airport to the village. MMC endeavour to collect as many people from your party in one load as possible, but should arrival times differ greatly, we may need to send additional buses at an additional cost. There are two possible routes. Drive through the center of Geneva, following the signs to Thonon-les-Baines and Evian. At Thonon-les-Baines follow the signs to Châtel/Portes Du Soleil, follow them directly to the center of the village. Take the Swiss motorway via Lausanne and Montreux, turning off at Monthey North. Follow the signs to and up the Pass de Morgins and then into Châtel. (Please note that on Swiss motorways you will need a ‘vignette’ which is a 5cm square sticker with the current years date on it. Most hire cars have them already displayed on the front window, if not most Swiss garages sell them for 40 Swiss francs for the year (about £20/ 25 Euros). Follow signs for Lausanne. Once on the motorway follow the signs for Grand St Bernard/ Simplon, (you need to pass the Basle & Bern turnoffs). About 20kms after Montreux turn off the motorway at St Triphon (the turn after Aigle). Then follow signs to and up the Pass de Morgins and then into Châtel. 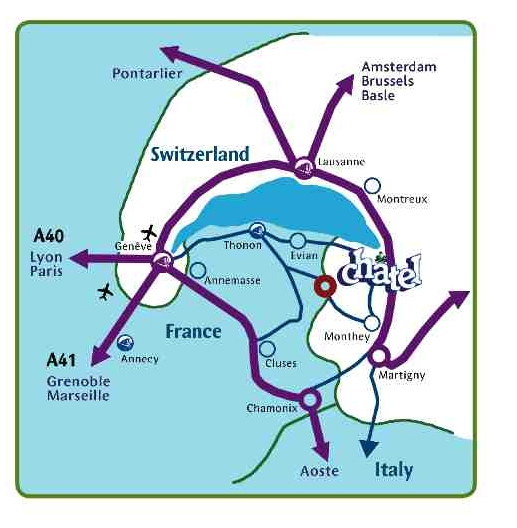 So now you’ve reached the centre of Châtel, how do you get to Le Jet D’Eau ?